At Tougaloo College, the story is in the soil. Its genesis in 1869, the purchase of 500 acres of red clay dirt in Jackson, Mississippi, by the abolitionist American Missionary Association, was meant to transform the site of a former cotton plantation into a college for freed slaves. Over the decades, the small cluster of antebellum and 19th century buildings, including a repurposed mansion that was added to the state’s Historic Register, blossomed into a full university. During the Freedom Summer of 1964, at the height of the Civil Rights struggle, Tougaloo’s grounds became a safe haven for activists escaping violence and intimidation. These humble roots make Tougaloo’s flirtation with an unorthodox architectural intervention even more of a curious story. In the late ’60s and early ’70s, a modernist architect, Gunnar Birkerts, designed a futuristic master plan for the school, a concrete city in the sky intended to literally and figuratively elevate the student body. 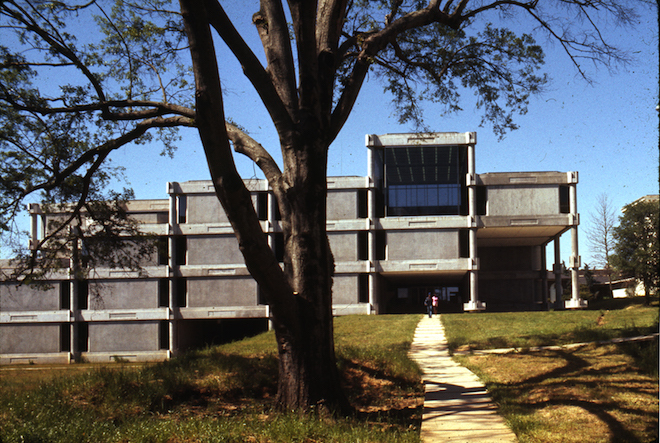 Started and then abandoned, the project left behind a few precast concrete structures on campus, Brutalist forms amid the genteel Southern landscape. Their presence serves as a reminder of a scheme built on, and sunk by, ambition. Gunnar Birkerts circa 1970. Photo by Balthazar Korab courtesy Bentley Historical Library. Model of Tougaloo College Master Plan, November 1966. Photo courtesy Bentley Historical Library. The genesis of the Birkerts master plan began not in Mississippi, but in Columbus, Indiana. J. Irwin Miller, who joined the family business, the Cummins Engine Company, in 1934, was a passionate fan of modern architecture; his Eero Saarinen-designed home still stands as a masterpiece. But starting in 1954, he took his belief citywide, supported by his company’s considerable fortune. The Cummins Engine Foundation began an ambitious program of civic architecture that would transform the Indiana city into a Modernist mecca by paying the architect fees of any approved project. “Mediocrity is expensive,” Miller was quoted as saying, but the list of architects whom he commissioned to redesign Columbus— I.M. Pei, Cesar Pelli, Richard Meier and both the Saarinens—couldn’t have been cheap. The New York Times said that in no other city did a philanthropist place so much faith in the transformative power of architecture. That faith, and the flowering of high design in Columbus, explains why Miller eventually felt comfortable extending his civic rebuilding projects elsewhere, and convincing an edgy, Latvian-born architect to design a liberal arts campus in Mississippi. Construction of Tougaloo College Library, Looking North, 15 February 1971. Photo courtesy Bentley Historical Library. Dormitory B, 1971. Photo courtesy Bentley Historical Library. According to Birkerts, Cummins loved that he came to a project without pre-conceived notions, that he “designed at the last minute” after learning everything he could about the site and situation. That approach, and his total unfamiliarity with the landscape, made him Cummins’s choice to work at Tougaloo. Cummins hired Birkerts to create a new vision for the 500-acre campus that, according to the architect, would prepare the students for working in the north, away from the violence of the Civil Rights era. While he was conducting site visits in 1965—after the violence of the Freedom Summer, when the campus served as a staging ground for the Student Non-Violent Coordinating Committee and the governor threatened to revoke the school’s charter—Birkerts was warned they might get attacked. “They needed to get used to an environment that was more urban,” Birkerts said, suggesting they had mostly grown up in poor living conditions. Dormitory construction 1973. Photo courtesy Bentley Historical Library. The plan that resulted from these visionary ideas consisted a series of raised concrete buildings that, from a distance, looked like a spaceship hovering above a traditional campus quad. According to Birkerts, the concept is much more grounded in reality. To accommodate a growing university, he devised a series of orthogonal modules, made from prefabricated concrete pieces cast on site, which could be expanded as conditions and enrollment dictated. The structures consisted of a lower, academic level, and an upper residential level, and were lofted above the unstable clay soul on caissons. It wasn’t meant to be a city in the sky, it was merely a modular system, primed for expansion, meant to integrate the student body and recreate a more bustling city streetscape. Like his previous work for Miller, it was designed based on what the site and situation required. The university loved the plan, according to Birkerts, enthusiastic enough to talk about building “the Harvard of the South.” But anyone walking on campus 50 years later, where just a few of the Birkerts structures remain standing, can see that vision was never fully realized. According to researcher Michael Abrahamson, who has studied and written about Birkerts’s work, the master plan was “a vision of the future, as opposed to a plan for the future … it’s utopian.” A PhD candidate in History and Theory of Architecture at the University of Michigan, he believes the plan amounted to a radical infrastructure proposal that just wasn’t just paternalistic in its focus on preparation, but unfeasible. Considering Birkerts was designing a space for 2,500, and the college then had just 600 students enrolled, the simulated urban environment was predicated on growth that never materialized. Current interior of Tougaloo Library. Photo courtesy Bentley Historical Library. Completed dormitory, 1973. Photo courtesy Bentley Historical Library. The Birkerts scheme also proved to be a utopian concept for the construction crews asked to build the modular concrete structures. While the plan was finished in 1965, the few buildings ever completed, a library and two dorms, weren’t finished until 1972 and 1973 due to persistent delays. First, Tougaloo wanted an integrated workforce, a challenge at the time in the segregated state. While that roadblock was overcome by importing workers from New York, the plan also called for an on-site casting plant to create the concrete structures. Contractors underestimated the difficulty of manufacturing as well as building, and the experimental structures became mired in delays. While the initial structures were finished, the school didn’t have the funding on enrollment to continue, and abandoned the plan. Currently known as A.A. Branch and Renner Hall and the L. Zenobia Coleman Library, the buildings have a complicated history, according to Kelle Menogan, the school’s Vice President of Facilities and Real Property Management. He says the student body’s relationship with the buildings could best be described as complicated. In addition to being hard to maintain, the concrete dorms are rigid, small rooms that weren’t built to accommodate ADA standards, the IT era’s extensive wiring, or the amount of material possessions carried by the typical college student. The buildings are so inflexible, to change a door, building maintenance needs to jackhammer out the surrounding concrete, since the frames were poured into place. While the open, airy library has become a popular spot on campus, the expensive-to-maintain dorms don’t have the best reputation. They’ve been called Lincoln Logs by students, Menogan says. Despite, or perhaps because, of his direct experience with the Birkerts buildings, Menogan still seems to believe in the optimistic aspect of the campus plan. As envisioned, the master plan would have eventually required the removal of a “beloved” core of nine buildings at the center of campus. Considering the historical significance of these structures, some of which date back to the 1860s, and the maintenance issues of the existing structures, campus development itself has been rethought, according to Menogan, and is currently being debated. Previous schemes would have gotten rid of the Birkerts buildings, but recently, administrators have given them a second look. One plan was floated that would turn the dorm buildings into offices for science faculty, laboratories and studios for faculty and arts majors, and repurpose the library, perhaps as a bookstore and IT office. Birkets says that he was disappointed that they didn’t finish more of his buildings, but he understands the financial realities of the situation. It certainly didn’t stop him; he’s gone on to have a prolific career, creating scores of libraries, museums and university buildings, and even was commissioned to create a glass library in his hometown of Riga, a symbol of Latvia independence struggle. But does Birkerts still believe that projects like this can make a difference and lead to social change? “I really cannot answer that,” he says.